NEW YORK — Miami and Wisconsin will clash in the 2018 New Era Pinstripe Bowl here at Yankee Stadium in New York and both teams enter this season closure confident about winning. The Hurricanes (7-5) and Badgers (7-5) are meeting in a Bowl game for the second successive season, following their collision in the 2017 Capitol One Orange Bowl. Wisconsin beat Miami 34-24 in that contest, but Canes head coach Mark Richt thinks his team is in a better position for this year’s rematch. “It’s time to get ready, no doubt,” said Richt, who revealed that his team has had some pretty good practice days this week. “The weather has been as good as we could hope for. The guys know we have a big task ahead of us,” he added. Both teams starting the season in the Top 10, with the Badgers ranked as high as No. 4, but slipped outside the Top 25 to end an injury-plagued season for each program. 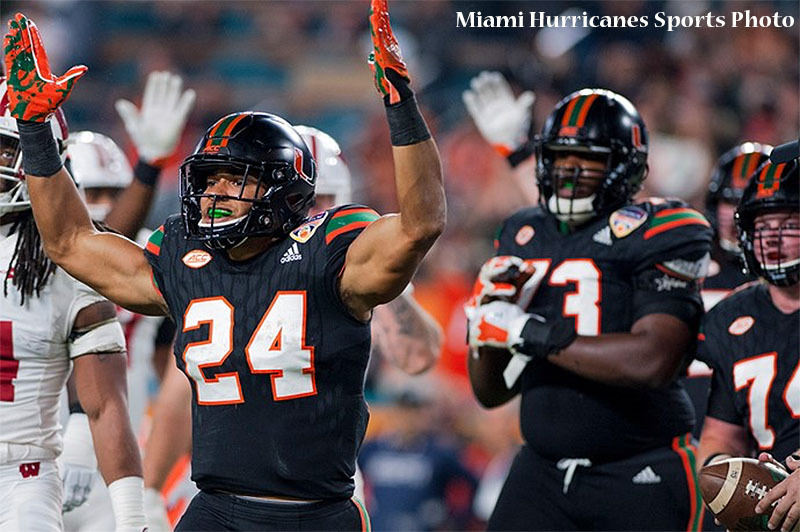 “It’s going to be nice to get them again from what happened last year, but it’s just another opportunity to come out and do what we need to do,” said Canes junior running back Travis Homer. Meanwhile, coach Richt has revealed that senior Malik Rosier will start at quarterback at Miami in this bowl game, while Wisconsin coach Paul Chryst announced that sophomore Jack Coan will start as the QB for his side. Elsewhere, both Miami and Wisconsin will enter this clash without key defenders. For the Hurricanes, All-America defensive tackle Gerald Willis is out with a hand injury, while the Badgers will be without linebacker Ryan Connelly, who is out after undergoing surgery for an unspecified injury. According to ESPN’s Football Power Index, the Miami Hurricanes have a 55.5 percent chance of beating the Wisconsin Badgers on Thursday evening.